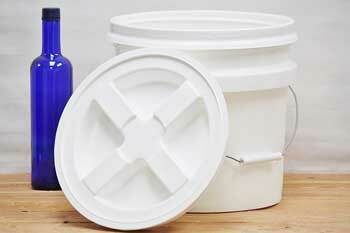 Our food grade buckets are FDA-approved and made of low-melt, high-density polyethylene. 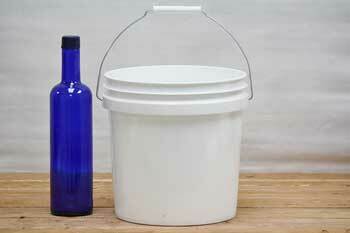 This process makes the best quality buckets for food safe storage and impact strength. They feature reinforced Saturn rings to prevent pail distortion and uniformly thick sidewalls for optimum stacking strength, as well as a tapered design for easy separation. Additionally, our buckets are made in the USA and are BPA free. In a small space you can store a lot of food for a long time. Reuse the buckets as many times as you want. For food storage you must have an airtight seal especially if you are not planning on using Mylar bags. 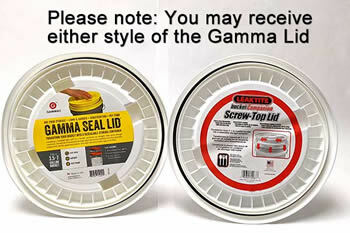 Our 3.5 Gallon and 5 Gallon gamma lids create an airtight seal. To store food in a bucket with a snap-on lid, use an airtight bag for your food. 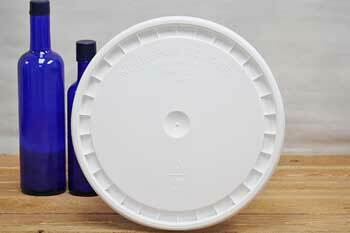 Snap on lids are best for storing dry products requiring constant access. Snap on lids are easily removed and resealed. 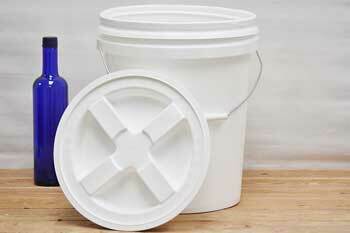 Our buckets are solvent resistant and safe to use with paint, varnishes, concrete, sealants, and asphalt coatings. Remember, when you put a chemical in HDPE plastic, it is absorbed and will leach into any food later stored in the bucket. Always store food in new food-grade buckets, made of plastic of stainless steel. Can you cook with galvanized steel? Yes, all food grade buckets are BPA Free. 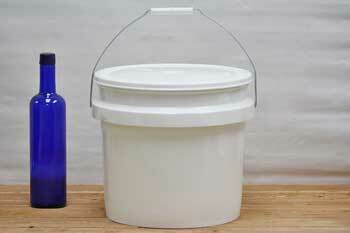 Food storage buckets are made with #2 HDPE plastic and BPA is found only in #7 plastic products. If you're going to spend time and money storing food you better make sure you're doing it properly! 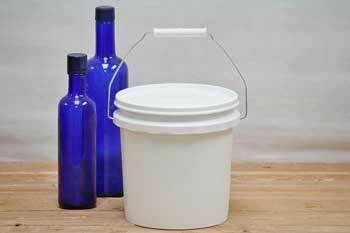 Storing food in food grade buckets is ideal. You can fit around 30 pounds of dry food inside a 5 gallon bucket. They're sturdy for stackable storage and they come with airtight lids to keep food fresher longer. To eat for a year, you need 24 standard 5 gallon buckets of food. 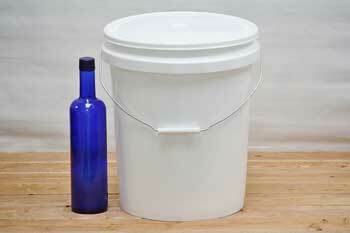 Food grade buckets keep out pests, moisture, light and oxygen for long term food storage. A mylar bag can be used as a liner for an extra layer of protections. Label the bucket with contents. You don't want to open buckets to find out what's inside. Store buckets a few inches off the ground. 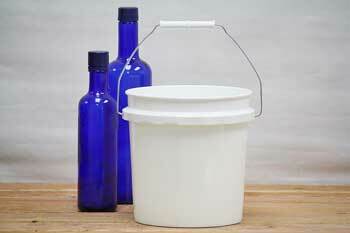 When it comes to plastic buckets the biggest question is always, "is it food grade?" You can find the type of any plastic by looking for a triangle - usually on the bottom - with a number inside. 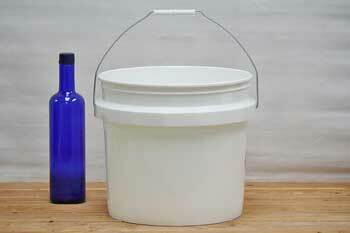 Most plastic buckets have a #2 inside the small triangle. #2 means the bucket is made with HDPE plastic. Most of these buckets are food grade but sometimes not. When dye is added to the plastic it is no longer a USDA approved food grade bucket. Recycled HDPE plastic sometimes restricts a bucket manufacturer from achieving the USDA food grade approval. When anything besides food like paints and chemicals go into the bucket, they are no longer safe to store food. Always buy new food grade buckets. #2 plastic is always BPA free. 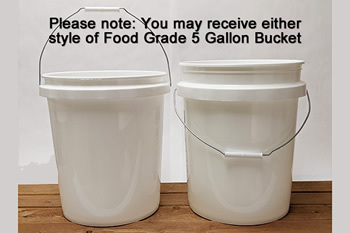 How do you know if your bucket is food grade? It is easy to check! First, find the recycling symbol. The USDA approves only #2 HDPE high-density polyethylene plastic as food grade. Molecules of this plastic are close together making it more stable and less permeable than other plastics. The bucket is the best build because it's the most rugged type of plastic. In addition no dye can be added. No colored plastic buckets are food grade - only white ones. Click for more specific information on what food grade plastic is.